Surulere, Lagos, for stealing an ATM card which belonged to one Musa Alli and withdrawing over N300, 000 from the account, with the help of her boyfriend, Adeyinka Ayodele, and two others. Alli, who reported the case to the Rapid Response Squad (RRS) of Lagos State Police Command, said that he met Imoleayo at a club in Surulere, last week Friday. 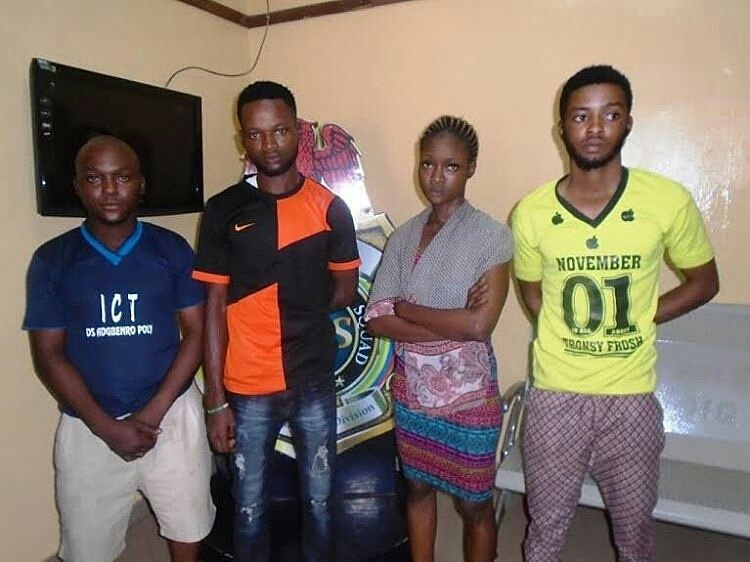 He added that Imoleayo had earlier stolen his ATM card before memorizing his PIN, during an online transfer of funds into his friend’s account. He said that he was shocked on Saturday afternoon when he received alerts amounting to N90, 000 withdrawals. He explained: “while I was still contemplating on how to deal with the issue, I got another debit alert for buying two Infinix phones totaling N84, 000. . I was confused and shocked. I didn’t know what action to take on a Saturday evening. On Sunday, there was another debit. I couldn’t pin the crime to the lady I met at the club. I lodged a complaint on Monday morning at my bank. It was unbelievable for me when I was face to face with the suspect, the lady I met at the club." Imoleayo said she pocketed the ATM card when Alli slept off during their conversation at the club, after she had spied on and crammed his PIN when he was sending money to his colleague via mobile app. She said: "I intended to only withdraw N20k, however, when I withdrew the money, and checked the account balance, I was shocked to see his balance. Afterwards, I withdrew another N70k. Then, the following day, I called my boyfriend, who instructed me to come straight to Itori, Ogun State. On getting to him, he called two of his friends, Abimbola Akintanna and Owolabi Bamidele, to use the ATM at any nearest bank. The following day, we went straight to Abeokuta to use the card. We bought two android phones for N84k. We proceeded to a boutique and bought clothes worth N126k. I recharged my phone with another N2.5k worth of recharge card."